Cleveland, OH (December 10, 2015) – The Greater Cleveland Automobile Dealers’ Association (GCADA) celebrated its Centennial last week, with an evening that featured an hour-long discussion with George W. Bush, the 43rd President of the United States. The event was held at the Renaissance Hotel in downtown Cleveland. Jason Stein, Editor and Publisher of Automotive News, interviewed the former President as part of a discussion that included Mr. Bush’s view on the importance of automobile dealerships and entrepreneurs as a driving force in the U.S. economy. 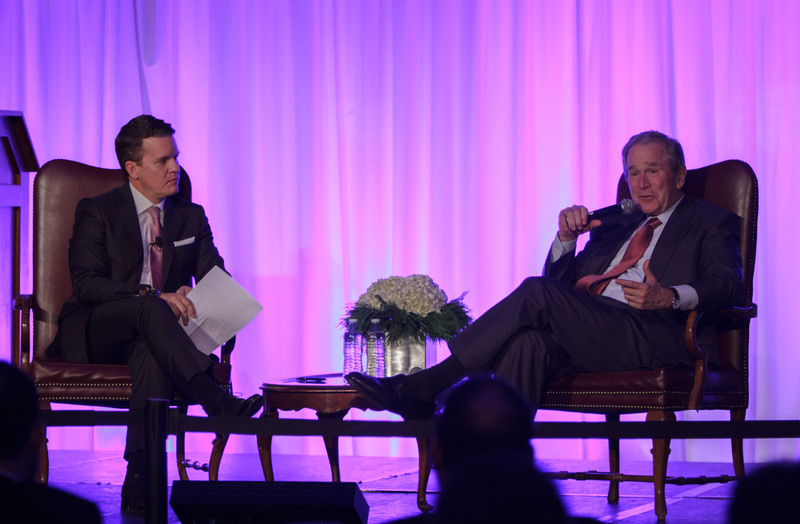 Mr. Bush also offered his insights into the current U.S. economy, the upcoming presidential election and the world political climate. For 100 years, the GCADA has acted as an advocate for its member dealers, as well as supporting numerous local businesses and charitable causes. In the last year alone, the GCADA contributed more than $175,000 for scholarships, post-secondary education, apprenticeship programs and other charitable causes. The GCADA represents more than 250 franchised new car, truck and RV member dealers from a 21-county region across Northern Ohio. The GCADA’s member dealers have a profound impact on Northern Ohio’s economy, employing more than 12,750 people. The GCADA also hosts the Cleveland Auto Show, which will open its doors Friday, Feb. 26 at the I-X Center in Cleveland.